Massage, Kung Pao chicken, and pressure ridges. After my chicken Kung Pao. I had this Sunday off. One of the lab techs here has a side business in massage therapy, he specializes in deep fascia techniques or Rolfing. I had a session at 8:30, Bethany at ten, and we set out for breakfast at 11:30. While Bethany ate her hash browns and eggs and I my Kung Pao chicken, we discreetly noted a middle-aged Inuit eating with chopsticks. Koreans dominate the restaurant business in Barrow. Most places serve Japanese, Chinese, and Korean foods, along with American dishes. Two eateries serve pizza, one only does delivery. The Bingo Hall serves a very good burger and fries, I’m told, at only ten dollars. I take most of my meals at the hospital cafeteria. The locum tenens staff and maintenance staff eat for free, a major perk in a town where milk goes for ten dollars a gallon. Bethany sometimes dines with me at the cost of $10 a meal. Our chefs cook with love and imagination, really the best hospital food I’ve had, and fare I’d be proud to serve my friends. After lunch I checked the temperature through the Internet and found 28 below Fahrenheit with a wind chill of 35 below (for you avant-garde Celsius fans, 40 below C equals 40 below F); with such mild breezes I decided to go for a walk. I’ve accustomed my ears to the high-pitched squeaking of snow under my boots; the colder the snow, the higher the squeak. Here I have to contend with the unnerving hollow sound my steps make when I’m walking on thick crust, a bit like walking on poorly suspended plywood, with less bounce. The sound makes me think I’m about to fall through. Overdressed for a walk in this weather, while the icicles grew on my beard I had to unzip my parka, later my bib overalls, and eventually I pushed my hood back. The cold keeps a lot of people in. Taxis, snow machines, and snow removal equipment comprised a majority of the vehicles. The few pedestrians I saw looked about a third my age. In the Top of the World Hotel parking lot, I saw something that I won’t see in Sioux City: a snow machine with its trailer, and in the trailer, unattended, a couple of rifles. 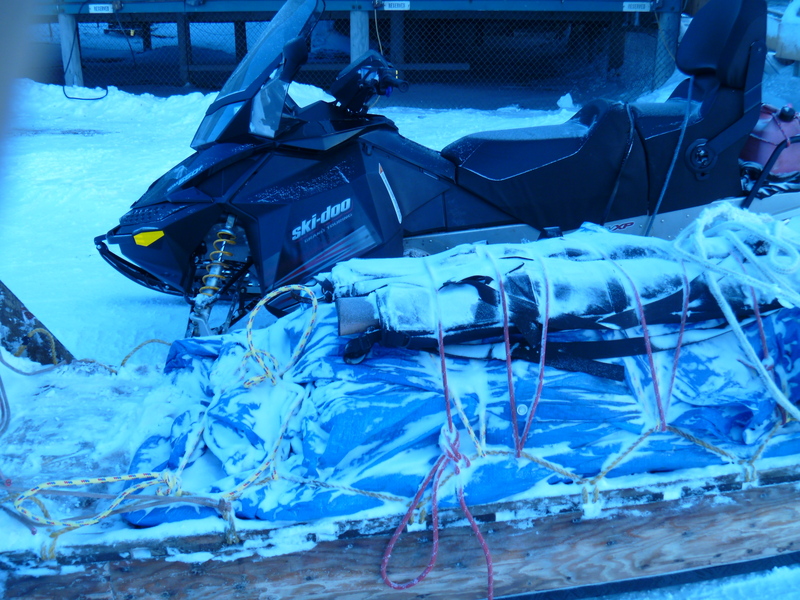 Sleds are toys at home but serious working vehicles here. Most trailers are homemade. 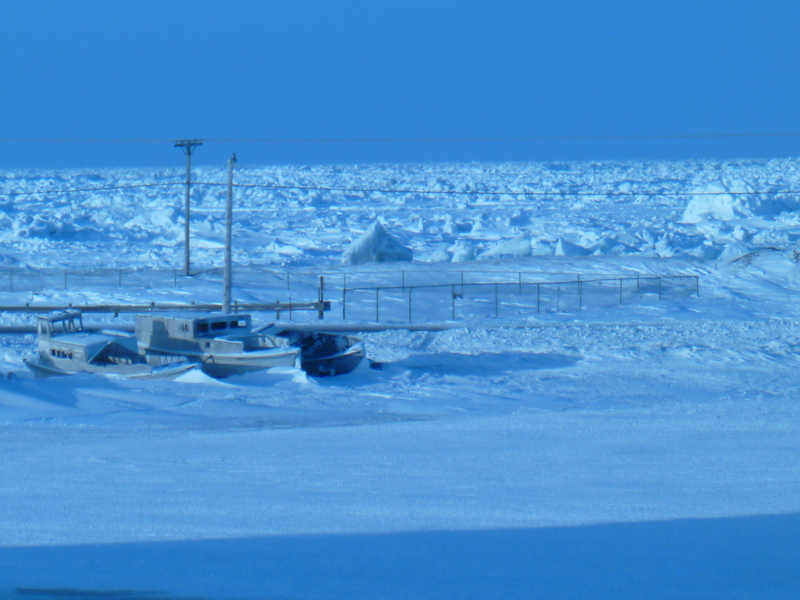 Recent high winds pushed the sea ice into pressure ridges; most of the blocks thrust twenty feet in the air are bigger than my Toyota. I was out for an hour and came back with beard full of ice. 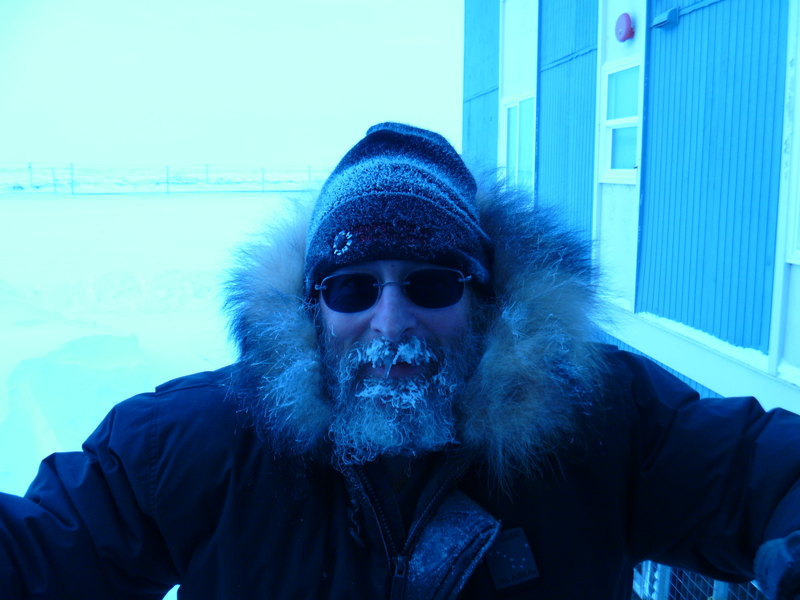 The author, after a walk, with ice condensed on beard, hat, and hood.